Product prices and availability are accurate as of 2019-04-17 16:15:21 UTC and are subject to change. Any price and availability information displayed on http://www.amazon.com/ at the time of purchase will apply to the purchase of this product. 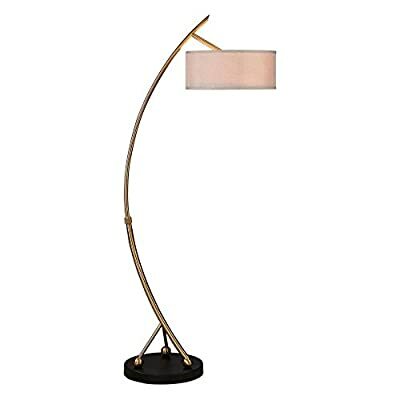 You’ll love the sleek, curving line of the Uttermost Vardar Floor Lamp. Its slim, metal base is finished in a plated brushed brass and sits atop a matte black foot. A rust beige linen shade completes the look in effortless style. Two 75-watt bulbs are required (not included). Dimensions: 17W x 17D x 68H in.. Shade dimensions: 17D x 7H in.. Beige linen shade. Brushed brass metal base. Requires two 75-watt bulbs (not included).